The chances are you came to my website because of grievances or a feud with another person, that could well be a member of your family or a close friend, and that isn't easy. At least 85% of families are dysfunctional, and more than 3 in 5 people will fall out with a close member of family and never talk to them again. Now that there is somewhere to document it, it has proved a great relief for people involved in these disputes. Some people say that life is too short to argue or hate someone but some may argue that life is also too short to waste time with someone that you are never going to meet on common ground. Destructive, dysfunctional relationships can hold us back in life and keep us from following our dreams or fulfilling our destiny. What our website aim's to do is make things that bit easier, it can help to offload some of the anxiety from your indifferences and relieve the bitterness that these disputes have caused. At disownyou.org we can take you through a non bias process, aimed at an outcome that can put things to rest, disownyou.org is the first and only official register in the world that can document and certify the disownment between two people. This hallmarked "certificate of disownment" will be embossed, stamped and then wet signed by the register keeper once it has passed approval, it will then document the information of the disownment between the two parties, we will then send it on your behalf by signed delivery (worldwide) to an address of your choice to alert of the disownment. The certificate will contain the disownment number and web address so the receiver can view the register online and see the reason for the disownment. Additional certificates may also be purchased and sent out signed delivery to other addresses of your choice at £16 per certificate. With all the details logged including your unique disownment number in order of the disowned register, you will also be issued with a date and time slot in GMT; this will then be entered into the register and can be viewed online. You may also click an option anytime to limit the amount of information viewable to the public in the disownment register. A picture may be uploaded but please read our terms and conditions first. With the option to send a copy of the "certificate of disownment" to any number postal addresses, this can help people to acknowledge your decision. Previously people have had nothing to go off other than a verbal agreement, now you can officially document your disownment. Please read peoples stories, quotes and comments section, and feel free to add your own. 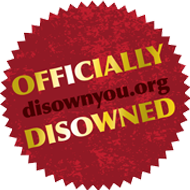 The purpose of www.disownyou.org is not intended to try and resolve any ongoing family problems neither can we give any advice on individual situations. The purpose of this site is for people with indifferences that have gone full circle and incapable of any resolution and who are looking for a final step to acknowledge this to others with a binding and registered vow that a severance of all ties has been made and logged. OK so you know what the site is all about and you may have used it to disown someone or not, but feel free to use the forum as this will be the window for case studies and requests from users to obtain different views and perspectives on their personal problems of disowning someone. It is very common for people to get blinkered in a situation and help from other neutral, non bias members can help people take a step back and look at the situation from another angle. * certain areas will incur a higher delivery charge or may not be possible for a signed delivery a request for a supplement towards extra delivery charges may apply with these areas.